Washington DC. A symbol of freedom and power in the eyes of our nation and the rest of the world. But in the shadows of the looming monuments and majestic government buildings, lies an underworld very different from the well-recognized images of our nation’s capital – a world ruled over by violent gangs and ruthless drug dealers. Based on Lior's award winning short, We Die Young is a fast‐paced crime drama taking place over the course of 24 hours in the brutal drug slums of DC, where a young Hispanic boy dreams of finding a new life for him and his younger brother. When a traumatized veteran comes into the neighborhood looking for drugs to escape his own reality, an unusual opportunity arises that will change their lives forever. Lior Geller's graduate short film from the Steve Tisch School of Film at Tel Aviv University holds the Guinness World Record as the most highly decorated student film of all time and earned Lior an Academy Award Nomination. 13 year-old Ismayil works for the most powerful drug dealer in the city of Lod; Daniel, a traumatized Israeli ex-soldier, often buys drugs from Ismayil, trying to escape his own inner demons. When Ismayil's little brother is hired to help him with a sell, he decides he's had enough, and in a frantic encounter deep in the city slums, Ismayil and Daniel find in each other a way out of their respective hells. "It races the heart and is a consistent thrill from start to finish." "In Lior Geller's entertaining, fast-paced Roads, it's as if he threw into the Israeli-Palestinian cement mixer Tarantino's Reservoir Dogs,GoodFellas, the Brazilian City of God and Fresh." "Lior Geller's Roads deals with political and social issues in a sophisticated and impressive manner, creating a fascinating cinematic experience, full of energy and passion. The film had us glued to our seats." 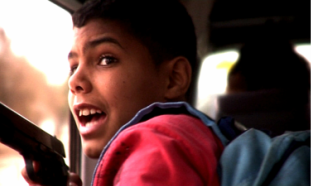 The Heart of a Jenin, a feature-length documentary, is the true story of Ahmed Khatib, a Palestinian boy accidentally shot by Israeli soldiers. His father then decides to donate his son’s organs to six Israeli children in order to save their lives. This German-Israeli-French co-production is a powerful story about Israel's people, who have learned to live with everyday conflict, but have not given up their hope for peace. After premiering at the Toronto International Film Festival in 2008, The Heart of Jenin played at over 50 international film festivals, screened on PBS where it earned an Emmy nomination, was theatrically released in Europe and won 9 awards, including the German Academy Award for Best Documentary. Lior recently completed the script Alone In Damascus, a spy thriller based on the true story of Israeli spy Eli Cohen. Planted by the Mossad in the Syrian capital, Cohen built close ties with Syrian leaders including President Amin El-Hafez, almost rising to the ranks of Syrian Defense Minister, circa 1960's, before being captured and killed in a public execution. The project is produced by Eric Eisner and his Double E Pictures who acquired the rights to the Israeli published book 'Alone In Damascus' by Samuel Segev, recounting the spy's true story.